Place fish filets in a plastic bag and add lime juice, ginger, garlic clove and garlic powder. Seal and shake bag to distribute marinade. Refrigerate for 45 minutes. Place each fish filet on a piece of 8x8-inch foil sheet, season with salt and pepper. Spoon out as much of the garlic and ginger from the marinade as you can and drizzle over fish filets. Fold foil inward creating fish packets. Place packets on a baking tray and bake for 15 minutes or until fish fillets are completely cooked. Serve wrapped in corn tortillas with lettuce, cherry tomatoes and your favorite salsa. Use chicken cutlets instead of fish for a dinner variation. The warm weather is here and fresh fish tacos are in order. 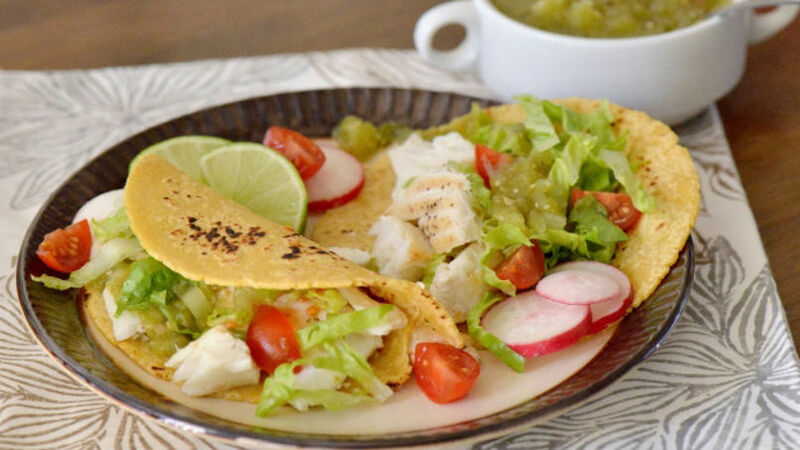 Transport yourself to the coast with these plump halibut tacos made in your own kitchen. Preparation is easy and the cooking is fool-proof; they are baked in just 15 minutes. Pair them up with your favorite taco toppings for an all-out taco gathering on your own dining room table!